As a group of Sangh Parivar activists fresh from the morning RSS shakha hit the campaign trail, some of them still in the trademark khakhi shorts, the narrow bylanes of Patel Nagar, a middle-class neighbourhood in the heart of Muzaffarnagar resonate with slogans of ‘Hindu-Hindu bhai-bhai’, ‘Vande mataram’ and ‘Ab ki baar, Modi sarkar’. The group comprises of members of the RSS and its affiliates like the Vishwa Hindu Parishad, as well as the RSS’s consumer forum. Here, as in other cities of Uttar Pradesh, there is none of typical RSS coyness about playing an overtly political role, as they hand out fliers and handbills asking for a vote for Narendra Modi, and for the local BJP candidate. But the message they are taking to voters is somewhat at variance with the BJP’s emphasis on growth and development. They say that none of them would be here, participating so vigorously, if it wasnt for Modi. The idea of supporting Modi as a champion of development seems secondary. One of the RSS activists told us that they hope Modi will be able to lift Uttar Pradesh from a mire of crime, unemployment and power cuts, just as Modi has done for Gujarat. Some of the forceful assertion of Hindutva we came across might have to do with location. The BJP’s main rival in riot-hit Muzaffarnagar is the BSP’s Kadir Rana, himself charged with making inflammatory speeches in the run up to the riot. Rana benefits from the demographics: Muslims and Dalits together make up almost 50% of the voters here, ensuring his massive victory in 2009. The only way for the BJP’s candidate – a local Jat leader, Sanjeev Baliyan – to stand a chance is to hope that the riots, and the Modi card, will lead to a Hindu consolidation, in which some Dalits too break away. The RSS introduced us to a pradhan of a Dalit basti in Patel Nagar, who says that he considers himself to be staunchly Hindu, and that he and his community will vote for the BJP. When we asked whether the Sangh Parivar campaigns in Muslim areas of the region, Ajay Bansal, the head of the RSS’ Patel Nagar shakha said that they tried, but were not allowed into those areas. Mr Madhav claims the primary role of the RSS was to help the BJP’s grassroot election management to which end they have put in place a grid, using the existing RSS structure. At the top are prant (region) in-charges, who head a cluster of 10 Lok Sabha seats. Below them, there is an in-charge for each Lok Sabha seat, and one for each of the assembly seats. Each assembly seat in turn has about 200 booths. The RSS has appointed an in-charge, known as a basti pramukh for every 10 booths. In Muzaffarnagar, as in other cities, the RSS has used this grid to carry out voter registration drives. “It has been going on for a month. You have to enter you mobile number, after which you get a message and a call from Modi that you are now a Modi supporter,” says a local RSS activist. To make the grassroot campaign more effective, the Modi campaign team and RSS have jointly created a website called bharatvijay.com. The site has been set up at the RSS’ request by Rajesh Jain, the Mumbai-based founder of software consultancy firm NetCore Solutions, someone who has been running Modi’s online campaign for the past several years. Jain’s team of 200 data engineers have processed a massive amount of election data of the past four Lok Sabha elections, covering nearly 400 seats, in a form that makes it useful for the RSS activists on the ground. What is clearly emerging is a RSS campaign that is operating at different levels, with messaging that alters depending on the context. For instance, The India Foundation, an RSS-backed think tank was behind organising an interaction between Modi and leading Indian corporates in New Delhi last month. But on the ground, the RSS messaging seems to inevitably drift towards a Hindutva idiom. The key question is: will the Sangh activists who fought so hard for a Modi sarkar expect a quid pro quo should it become a reality? 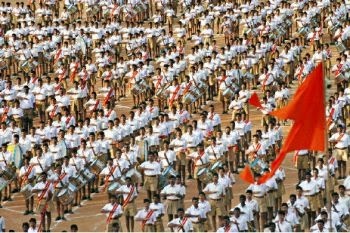 Given his track record in Gujarat, Modi may be able to keep the demands of the Sangh Parivar – mainstream and fringe – at bay, but RSS watchers say that accepting such overt RSS support, could prove a greater challenge for Narendra Modi, than immediate demands for quid pro quo by the saffron coalition working to ensure his victory.